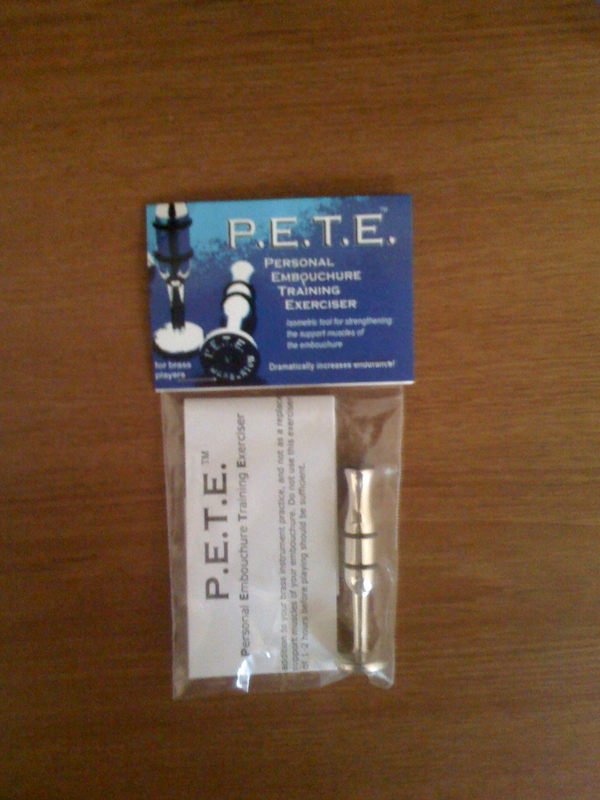 P.E.T.E stands for Personal Embouchure Training Exerciser, a tool created by Ken Titmus and Terry Warburton. This tool is designed to help a brass player strengthen the embouchure muscles away from the instrument. The P.E.T.E. is based on two different types of exercises, one which uses a simple pencil and another that used a large button. Titmus and Warburton have combined these two exercises into a a single tool. People who are familiar with my specific interests within brass pedagogy may be surprised to find me criticizing Donald Reinhardt, as his writings were one of my primary sources for my dissertation. Even though I never studied directly from Reinhardt, he has been a major influence on my approach to teaching and practicing. While I think he has been unfairly dismissed by many brass teachers who misunderstand his approach, the writings he left behind are in a large part to blame for the confusion. Many of his former students, who insist on teaching exactly as he taught, also further exacerbate the confusion. Donald Reinhardt (1908-1989) was a trombonist and brass teacher. As a younger man he had some playing difficulties that he was not able to practice his way out of and had many teachers that were also unable to make recommendations that led to real progress for him. One day, after an accident damaged his tuning slide, he got the repaired instrument returned without the counterweight attached. This resulted in a much lower horn angle than he was used to playing with and he discovered that this allowed him to finally play a high B flat for the first time. Curious as to why this different horn angle would have such a profound effect on his playing, he first built mouthpiece rim visualizers and then fabricated transparent mouthpieces so that he could study the differences between the embouchures of different brass players. After some years of study and teaching private lessons for free to test his ideas, Reinhardt developed an approach to teaching brass which he wrote about in a couple of different books. The most detailed of these was his Encyclopedia of the Pivot System. I recently saw a reference to Frank Campos’ book, Trumpet Technique. In it, Campos tells of a story by Reynold Schilke.
. . . Arnold Jacobs and a tubist from Japan were trying out a new tuba in front of an electronic tuner. After Jacobs played, the tubist from Japan found he had to pull the tuning slide considerably farther out than Jacobs to play in tune. Schilke was curious about why the same length instrument would not play in tune for both men. After some investigation, he determined that Jacob’s oral cavity was much larger than that of the Japanese tubist, and that the vibrating air column created by each player originated within the oral cavity at the back of the throat, rather than at the mouthpiece. In this case, the air column was longer for Jacobs due to his larger oral cavity and shorter for the Japanese tubist, and this required a change in the length of the instrument to match the tuner. 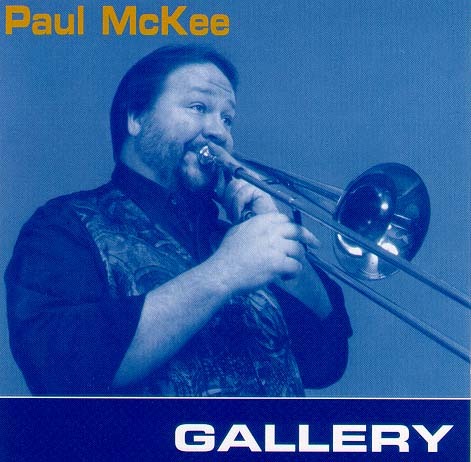 2000 debut release as a leader, Gallery, features Paul as a writer as well as a trombonist. Guest artists on Gallery include Bobby Shew on trumpet and the late, great Carl Fontana on trombone. Paul has taught at DePaul University, Northern Illinois University, Youngstown State University, and University of Missouri – Kansas City. He teaches now at Florida State University. Back in 1993 I sat down with Paul and interviewed him as part of a class research project. The interview was so much fun that when I recently came across it I asked Paul if I could make it available and share it. With his permission, here is an interview with Paul McKee. 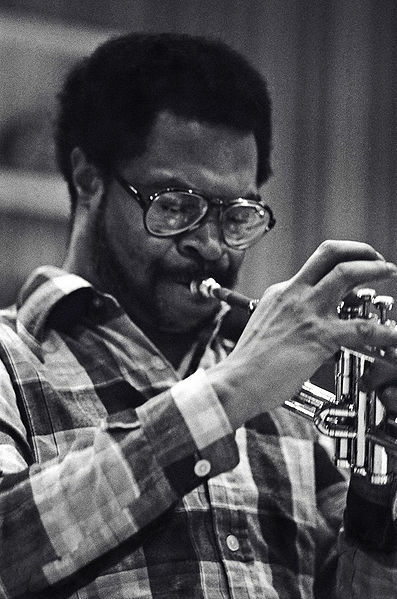 Trumpet player Woody Shaw (1944-1989) was one of the most influential jazz trumpet players of his time. His solos still sound fresh and innovative to me today. Which is why I decided to transcribe his solo on the blues in F, The Blues Walk (from Dexter Gordon’s album “Gotham City”) and try to get into some of the harmonic and melodic innovations he was known for. One thing Shaw was known for doing was employing larger intervals, such as perfect 4ths and 5ths in his melodic lines. Here’s one example from this solo. Two in a row today. I recently came across another video of a horn player, Bruno Schnieder, with a quick close-up look of his embouchure. Take a close look at almost 1:00 into the video. Unfortunately, there’s not enough in the video to see his embouchure motion, but his mouthpiece placement is obviously upstream. Schneider is almost certainly a Low Placement embouchure type. It’s time for another installment of “Guess the Embouchure Type.” Today, I’m going to try to guess the embouchure type of German hornist Nury Guarnashelli. Today is the first day of classes in the new fall semester for me. To mark this occasion, here are some items from the annual Beloit College Mindset List for the class of 2014. This list is put together by Ron Nief and Tom McBride every year to help faculty members get a better understanding of cultural values and backgrounds of incoming freshman. Here are some of my favorites from this year, mostly the ones related to music. “Cop Killer” by rapper Ice-T has never been available on a recording. There’s a lot more in the complete list. Most of it is trivial in the bigger picture, but it does make for an interesting look at the class of 2014. Anyone else feeling a little old right now? One of my favorite composers is Jim McNeely. Although I was familiar with him as a pianist earlier, I didn’t discover his writing until I was a graduate student at DePaul University. While I was a student there (1992-1994) McNeely was brought in as a guest artist to perform with the Jazz Ensemble. He sent one of his new compositions, Jump Start, ahead of time and we performed it with him as a soloist. I believe that may have also been the premier performance of this chart, although I think it was later recorded by the Vanguard Jazz Orchestra. McNeely often writes charts that are loosely based on the changes to other tunes. Jump Start, for example, was based on the changes to My Shining Hour. Another chart of his I’ve played before is Paper Spoons, based on the tune It’s Only a Paper Moon. Ronan, from the blog Mostly Music, posted a nice interview of Jim McNeely. In it, McNeely discusses not only how he got his start as a composer, but also how he learned a great deal about jazz composing by performing contemporary chamber music as a student, his composition process, and how he approaches things like form and orchestration. It’s a great read and offers some nice insights that other composers might find helpful. “The brain is a pattern seeking organ, so it looks for patterns in music to make sense of what we hear. The music of Bach, for example, embodies a lot of the pattern forming process.